Posted on 19th August 2008 — jQuery has got good base level support for effects out of the box. Setting them up and using them to reveal and hide elements is exceptionally easy. However – if you’re still using versions below 1.3 – read on! However, on more than one occasion I’ve found that after creating a sliding effect, the animation jumps on completion. Having found the cause, I thought it only fair to share and explain why it’s happening and how to avoid it. The way the slide animation works is it animates the height CSS property of the element. The problem occurs if the element being animated has a margin or padding. This is because when the element shifts from display: none to a tiny height (or width) and visa versa, the padding (or margin) jumps in to view, causing the real height to be height + padding + margin. If you look at the screenshot below, you can see the padding is still visible but the height of the element is 1px, the next step is the to display: none, which in this case, the blocks below will jump up 32px (padding-top + padding-bottom). The solution is very simple to fix once you’ve understood the problem. 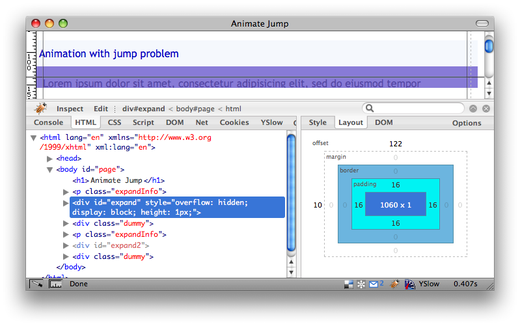 We’ve moved the padding away from the animating element and so only the height affects the height of the sliding block.